Blonde Brennan smiles in Season 8 premiere of Bones, "The Future in the Past." The episode airs September 17, 2012. 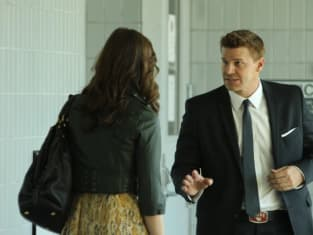 Bones Season 8 Episode 1: "The Future in the Past"
Jim's Notebook: Scoop on Covert Affairs, Dexter, Bones and More! Bones Producers Preview Season Premiere, Ask: Who Can You Trust?